With mushrooms, carrot, kohlrabi, parsley, and peas, this creamy fricassee will keep your kids veg-fueled for a busy day. You can easily prepare it in advance or make extra portions for freezing. This is a great recipe to make with your children. You can use store-bought pizza or puff pastry dough and ask your kids to spoon the fillings onto each square, then fold over and seal the triangles with their forks. For the fillings, you can get a bit experimental. Pesto, cheese, tomatoes, peppers, and onions all make great fillings. And most importantly—have fun! This is a great vegetarian dinner option, full of exciting flavors and an abundance of colorful vegetables. Make sure you use a mild curry paste. If cooking for children under 5 years, blend or chop the cashew nuts very finely. The whole family will love this creamy dish. Fish is so good for us because it’s full of nutrients, vitamins, and the world’s best source of omega-3 fatty acids, which help our body and brain to excel. Although many children dislike fish, they will love this recipe. The fish nuggets are bitesize and coated in something they know and enjoy. Ask your kids to smash the cornflakes for a finer crust. They’ll have fun making and eating them. Serve with peas. Every child loves a warm, fluffy waffle. This is a great way to serve them as a savory dish. If cooking for very young children, simply reduce the amount of dried chilis and use chicken breasts instead of thighs. 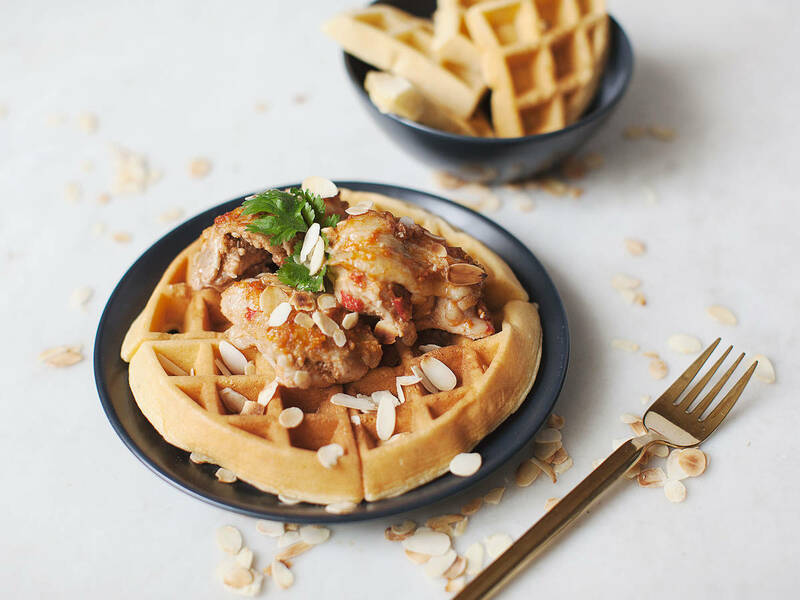 The waffle batter and pesto can be prepared in advance. Serve with green beans. This recipe is a winner in terms of versatility. The meatballs taste delicious on a bed of rice, alongside pasta, or simply with a fresh baguette to dip. You can easily double the quantity and serve it for two days in a row. With plenty of veggies and fresh herbs, the tomato sauce is a healthy homemade option. Who says you can't have pancakes as a main? In many German schools and nurseries, pancakes are part of the lunch menu. Commonly served with apple sauce, but also super delicious with a handful of berries or a dash of fresh-squeezed orange juice, pancakes are an all-time favorite, no matter what meal of the day. These pancakes are even healthier with all-natural ingredients. A true guilt-free pleasure!